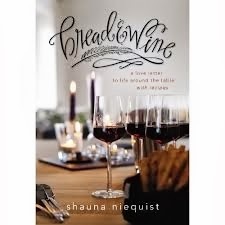 a book chick: "Bread & Wine"
my take: This is Shauna's third book of essays/memoir. In Bittersweet, it was pretty clear from her writing that she wanted to write about FOOD. As in write a cook book. I was a bit dismayed when Bread & Wine began with more of her woes of not being able to get pregnant. And, I give her kudos for the vulnerability it takes to know you need to move on and admit you can't quite. Mostly, though, this book is about the healing, love, caring, joy, grace, and hope that come from sharing food around the physical table and the spiritual table. Food is Shauna's love language and she is happy to teach her native tongue. Almost every chapter ends with a recipe ... I've tried one so far and will definitely try to get to all of them - kinda fancy without being super fussy. Shauna brings the family meal and the dinner party back to the table. my source: daughter Anne, for Mother's Day. Isn't she a peach? my verdict: Lovely, and mighty tasty, too.